Let us welcome you to Amsterdam, a city of 180 different nationalities and a place of many inspiring and surprising faces. 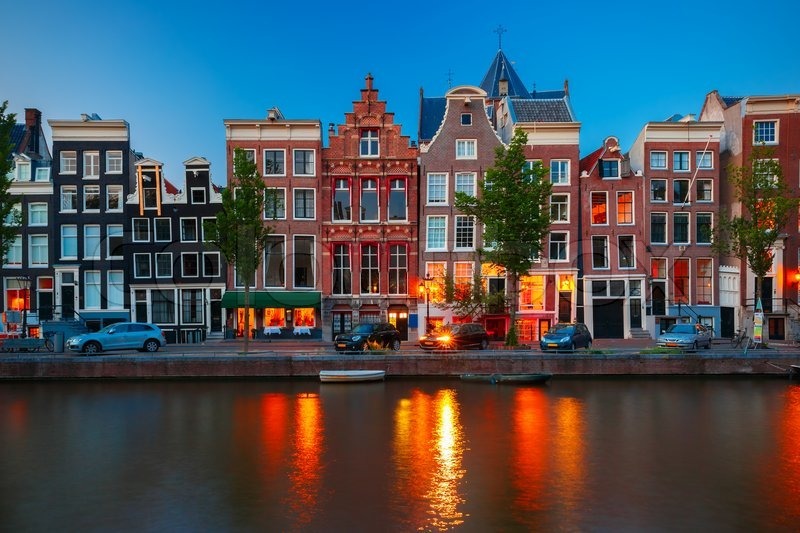 No other city mixes cosmopolitan style and relaxed atmosphere quite like Amsterdam, where our hospitable nature attracts an excitingly diverse population. We invite you to join us and make our metropolis your own during your stay. Also check the website of Iamsterdam for info about Amsterdam. Amsterdam has a long and impressive sporting tradition. In 1928 the city hosted the Olympic Games. The recently renovated Olympic stadium is a lasting legacy of this event. More recently the city has hosted numerous major sporting events. In 2010 Amsterdam hosted the start of the Giro d’Italia. With 41,600 participants in 2013 the annual Amsterdam marathon is one of the largest marathons in Europe. In 2016 Amsterdam organised the European Athletics Championships. In addition, the city has witnessed the many successes of Amsterdam-based football club Ajax, both nationally and internationally. The historic city of Amsterdam is not that old. Before the first inhabitants arrived in about 1000 it was just marshland. It’s first mention in history is in 1275 and it only became a city after 1300, about the same time that the dam was built on the river Amstel where the current Dam square is. Most of the wooden buildings burned down (one of the three remaining wooden buildings is a bar on the Zeedijk near Central Station – well worth a visit). The classic buildings and canals of the centre are a result of the “Golden Age” between 1570 and 1700 where the city was the richest city in the world and grew in concentric circles from 30,000 to 200,000 inhabitants. The decline after the Golden Age meant there was no money to replace all of the old buildings. The oldest part of Amsterdam is between the Dam and Central Station and the Red-Light district. Other areas worth a visit if you want a bit of culture and history are thegger, Jordaan, the 9 streets (9 straten), Rembrandtsplein and Utrechtersestraat, Nieuwenmarkt and Spiegelstraat where there are lots of small bars and restaurants. Culture in Amsterdam is probably something you will not have time for during the Amsterdam Sevens. We have museums to spare, from the famous museums such as the Rijksmuseum (the Night watch and a lot more), Van Gogh Museum and Stedelijk Museum (Modern Art) to the Torture Museum and the Hash Museum. Theatres are mostly in Dutch but all of the cinemas show films in the original languages. Whether admiring the Golden Age gabled merchants’ houses of the old city centre or marvelling at the sleek skylines of the new Zuidas and harbour areas, you will see that the people of Amsterdam pride themselves on the city’s rich history while keeping focused on the future. Creative energy and innovation abound, strengthening and inspiring the established international business community. Are where you can buy and smoke cannabis/marijuana/skunk/weed/hash. If you do not mix it with tobacco you can smoke it inside. You can find coffeeshops all over the centre but the density is highest in the Red-Light District, especially along the Warmoestraat. In the centre of Amsterdam, they are mostly used by tourists. Coffeeshops are under threat as more and more restrictions are placed upon them. The latest restriction is to close coffeeshops within 250 meters of schools. You will normally be presented with a menu of the wares from all over the world but beware; the stronger varieties, including Nederwiet, are much stronger than people outside the Netherlands are used to. But remember, smoking dope is not big and it is not clever and is the exact opposite of performance enhancing. Amsterdam is famously gay friendly. The Gay Pride festival at the beginning of August attracts massive crowds from around the world. Reguliersdwarstraat and Amstel are the places to be if you want a party during the Eurovision Song Festival. Most shops in Amsterdam are open on Saturday and Sunday. I know of a few people who bring their partners to Amsterdam and let them loose in the city with a credit card while they are at the Sevens. Make sure you keep them away from the PC Hoofdstraat. This has many designer label shops for clothes (Trussardi, Hermes, Ralf Lauren, Tommy Hilfiger, Armani, Canali, Hugo Bos, Gucci, Chanel, Valentino, Kookai, Lacoste, Scapa, Claudia Strater and many more) but also things like luggage (Louis Vuitton) and jewelry (Bulgari, Cartier, Schaap en Citroen) and this could cause serious harm to your bank balance. Kalverstraat is a pedestrian shopping street that is the most expensive streey on the Dutch Monoply board. It is very, very busy on Saturday and Sunday. More relaxed and with lots of small and specialist shops are the Negen Straatjes (nine little streets). Go on Saturday as many close on Sunday. The streets are Hartenstraat, Reestraat, Gasthuismolensteeg, Beerenstraat, Wolvenstraat, Oude Spiegelstraat, Runstraat, Huidenstraat and Wijde Heisteeg. There are also many other small shops in the streets between the canals between Raadhuisstraat and Brouwersgracht. Is next to the red-light district around Zeedijk. There are many good Chinese restaurants in the area, fairly cheap, good and usually with authentic Chinese cuisine. Some do not have a drinks license so you may finish up drinking tea.